Spectral Conquest is a potential powerhouse of sonic manipulation, thanks to its scripting functionality. Scripts offer vast flexibility. Easy spectral manipulation. OSC control of parameters. CPU-friendly. Interface could be improved. Minimal script feedback from GUI. No 'true stereo' scripting. Effects that work by directly manipulating the spectral content of an audio signal aren't new, but making the process easy to complete as well as musical and creative is quite a task. That's exactly what Expert Sleepers are aiming to accomplish with Spectral Conquest. Before you really get going with it, you need to get a handle on the interface. 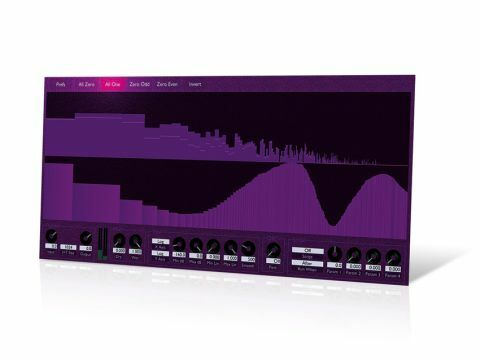 This isn't helped by the fact that the entire GUI is in the same shade of purple that Prince was fond of in the mid-80s. There's also very little contrast in the on-screen text, especially in the small light purple lettering surrounding each control section. There's even a shiny, reflective visual effect that moves across the bump-mapped background underneath your cursor. When this falls across the white presets in the top border of the window, it's almost impossible to make out the text, though at least you can disable this in the Preferences panel. Fortunately, the GUI elements are very responsive, as is the real-time plot of the audio spectrum, which is the uppermost graph. This bounces around to the input signal with little perceivable latency, and makes it easy to zone in on a specific sound - just listen for the audio element you're interested in and note which frequencies jump in response to it. There are several controls for adjusting the display's response, which helps with interpreting the incoming audio. Each slice is termed a 'bin level' in the world of Spectral Conquest, and the output amplitude of each band is displayed as a small line on the spectrum plot. You can split the signal into as many as 2048 bins and as few as 16 (intermediate values are available in powers of 2), and the CPU consumption is impressively low. To effect the sound, you can use the bar graph beneath the spectral display to adjust the relative amplitude of each frequency slice, much as you would with a graphic equaliser. You can further manipulate the spectrum by clicking on several buttons on the top border that will apply a series of presets, either setting odd or even slices to 0, blanking all values or inverting them. In addition, you can apply a script, as explained in Super script below. We found the results very pleasing to the ear. Filter effects such as high-pass, low-pass and notch are a breeze, and you can get unusual results by muting selected harmonics. Extreme effects are also easy to come by, and a number of the supplied scripts are ideal for this, such as gate (mutes frequencies above or below a threshold) and reverse (high frequencies become low ones and vice versa). Spectral Conquest's best feature isn't overly visible from the GUI, but it's hinted at by the four parameter knobs in the bottom right panel of the screen. This is where you can load a script: a series of commands that modifies the spectral data. The four knobs can be used to adjust values within the script, giving the user hands-on control. However, scripts can't feed data back to the display, not even to add a label to the knobs so that you know what they actually do. Scripts are written in Lua, which is an easy enough language to learn. If you've used tools like Max, Pure Data or even Reaktor, turning your ideas into scripted actions won't be too tricky. Expert Sleepers have already released a few more example scripts, including a low-pass filter with LFO and a spectral freeze effect. One caveat is that while the processing is in stereo, scripts can't access the channel data separately, so you can't manipulate the stereo field. Sans scripts, Spectral Conquest is a sound way to achieve spectral manipulation, although it's not quite up there with the competition - but then neither is the price. Factor in the scripts and there's an enormous amount of potential here, whether you choose to roll your own or simply use those created by others.